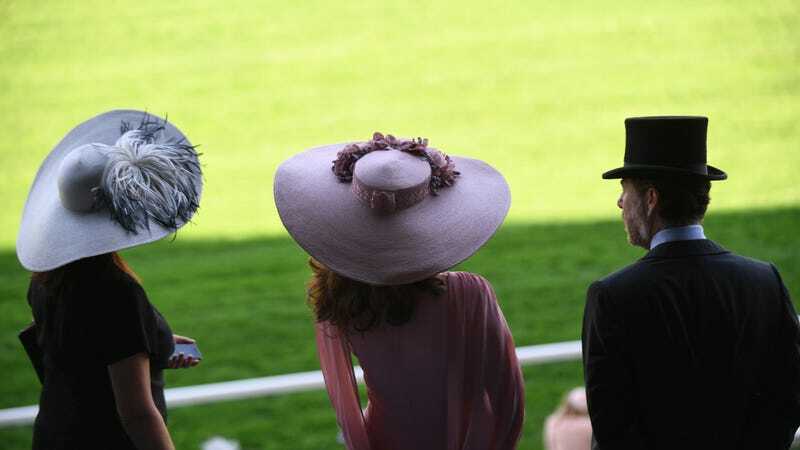 Royal Ascot has just wrapped for the year, and you know what that means—it’s time for our annual celebration of attending hats beautiful and bonkers, sublime and silly. Not a visible part or a bald spot in the place! Here are some nice roses. This woman’s hat looks like a Schiaparelli octopus. The Queen of course wore a bright, bright, bright color with some traditional floral detailing. This hat actually has a purpose for its eccentric design—promoting the RAF Benevolent Fund. We probably cannot say the same for the spaghetti. God bless this ridiculous tradition and its ridiculous dress code; long may it entertain us.